Designed by Leslie Jones Architecture on behalf of Queensberry Real Estate, Friars Walk opened its doors to the public in November 2015. 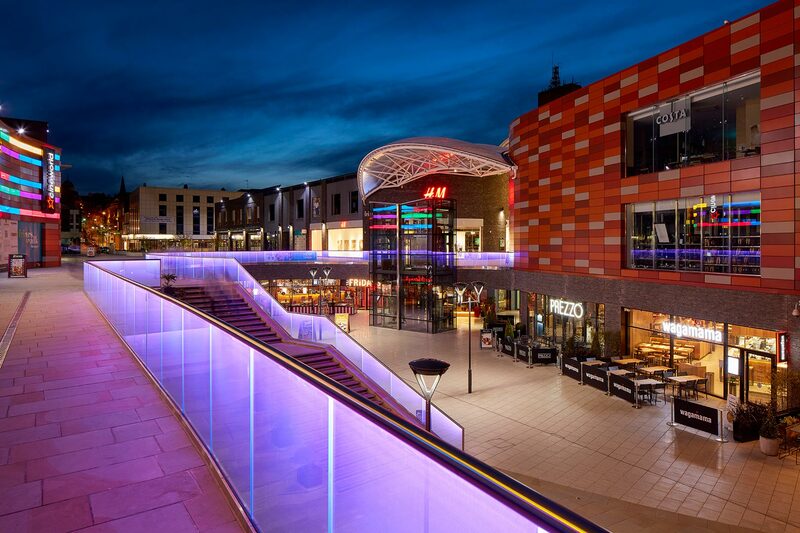 The Light Lab team were tasked with the manufacture and installation of 186 metres of illuminating glass balustrade to the line the edge of Friars Walk, a £117 million retail and leisure development. 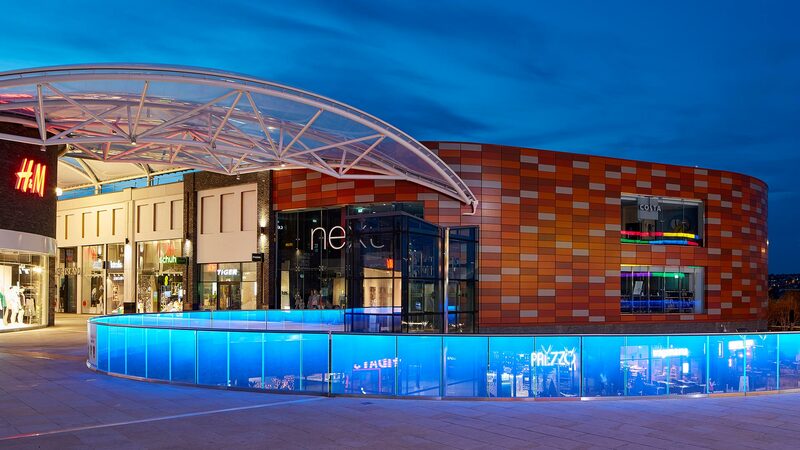 The 390,000 sq ft destination was developed in line with Newport city centre’s ongoing regeneration and serves to reconnect an unheeded area with the rest of the city. 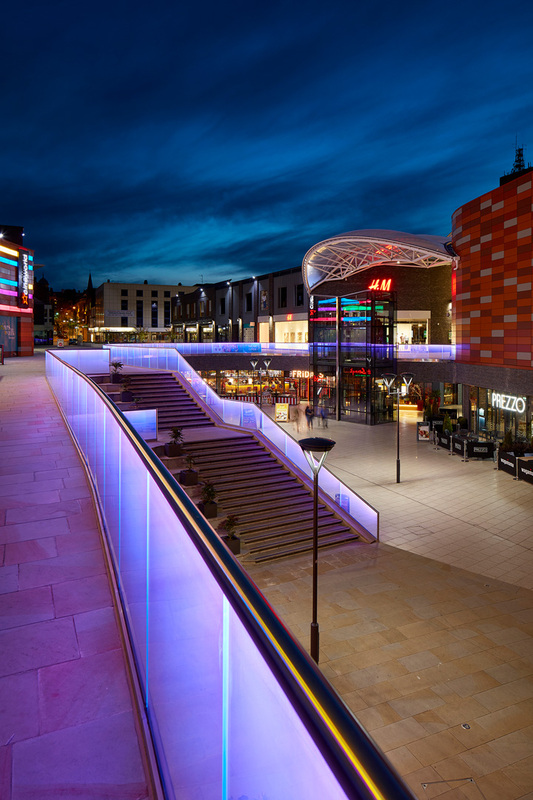 After an invitation from Leslie Jones, the team were briefed with the client’s requirements for a colour-changing illumination that started from the plaza’s handrail down and was structurally capable of meeting assembly loads for crowded public areas. 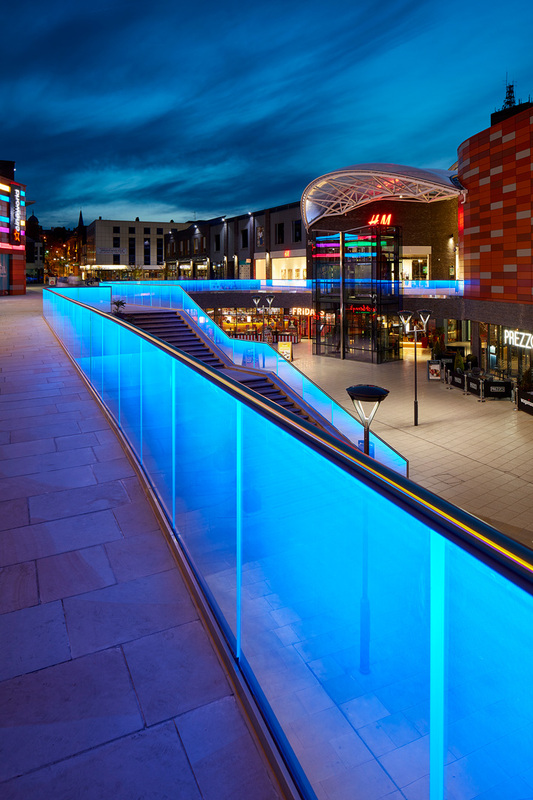 The balustrades were required to feature both faceted and curved sections, adding to the design challenge. 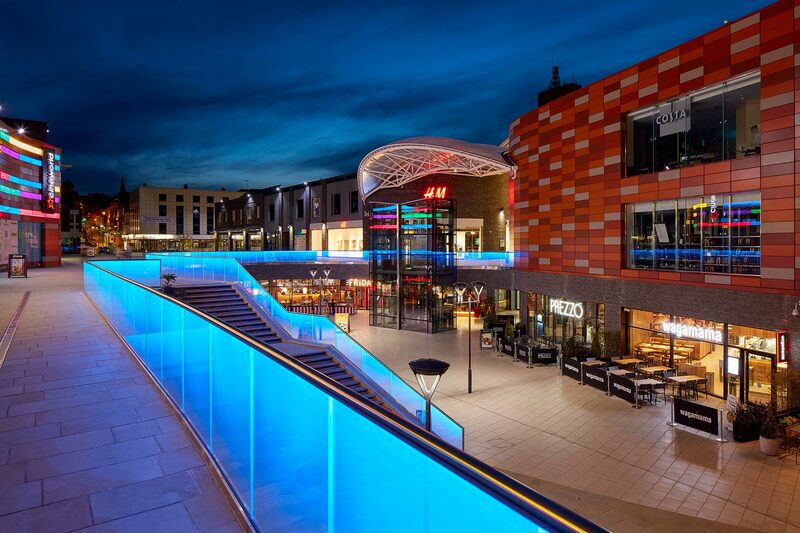 The team approached the project inspired by their previous work on 97 Uxbridge Road and enlisted the help of an expert team of structural consultants who ensured the manufacture and set out was correct for the installation before proceeding. The vast experience of The Light Lab’s on-site team was integral to the construction as the project required great precision and accuracy when setting out and fixing a feature of such size. 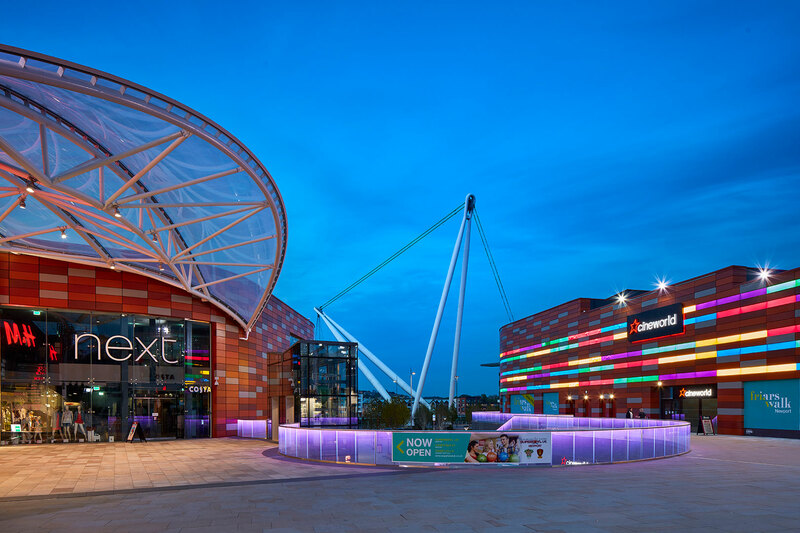 Although extreme weather conditions set out to hinder the build, the team persevered and adapted professionally in order to program the installation. 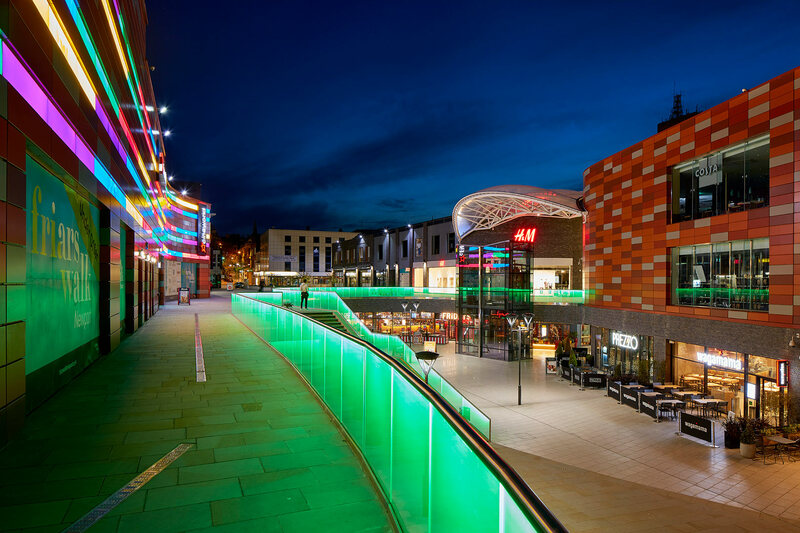 The team ensured that the finished product would give full control over the RGB illumination, allowing for coloured pavements with a selection of pre-set colours as required. 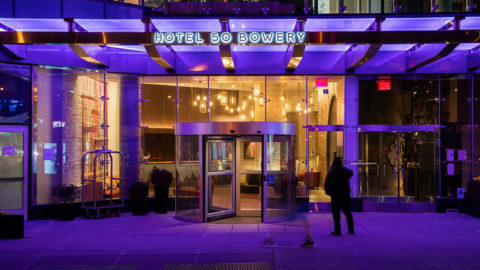 The result was a display of impactful lighting that served to bring a long-lasting burst of energy to the building’s exterior. Friars Walk is now set to make a mark on the city centre as one of its most iconic buildings.